The Zimmermann Spring 2019 collection was said to have been inspired by an old Australian soap opera called “Number 96.” Nicky Zimmermann reimagined the wardrobe for the show by drawing inspiration from it – complete with flowing dresses, bell sleeves, floral prints, and even a retro-aqua blue track suit. It’s also been said that the collection was spy-inspired, showing elements of 007 trenches, oversized bows, leather berets, and the likes. 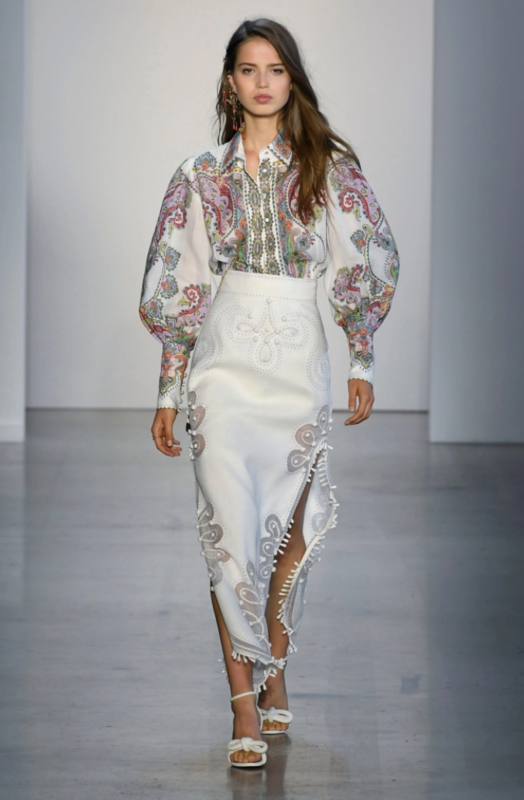 I’m not one to be contrarian, but upon seeing the collection (and the way they showed it) my mind was immediately transported to Spain; I was reminded of a bullfight – the models like matadors fluttering their billowing capes, stepping side-to-side, commanding the room with each empowered stride. Let’s start from the beginning, the show was held in one of the two main NYFW locations at Spring Studio on Varick street. The runway was set up to have the models walk around mirror structures, which gave guests the chance to see the clothes from every angle as they walked up and down in what virtually feels like a split-second. Another added element of the runway design was how it worked to showcase the movement in the clothes. Feminine designs are usually paired with words like flirty, flowy, or floral, and in this case, there was plenty of that. But more than that, the femininity that the Zimmermann spring collection showed was strong and felt intense in a powerful kind of way, especially while watching the models navigate the zigzagging runway. Before walking into the show, models, celebrities, influencers, and media all swarmed outside despite the freezing weather. There were so many photo-ops I honestly couldn’t get enough. 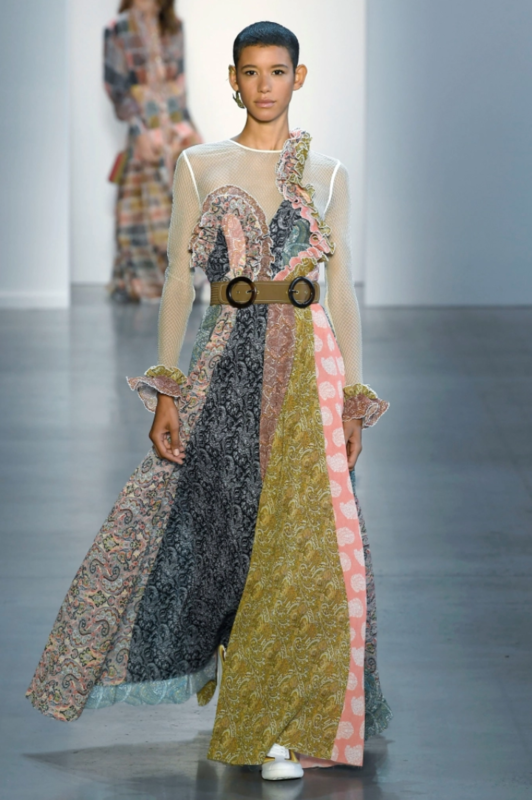 A veritable who’s who in fashion, the Zimmermann show brought out all of the industry’s finest. I saw everyone: Charlotte Groeneveld, Caroline Daur, Camila Coelho, Emily DiDonato, Aimee Song, Xenia Adonts, Sanne Vloet, Victoria Lee, Dev Windsor… the list goes on, and on, and on. February in New York City is no joke, it’s so cold! But despite the conditions, Fashion Week duties called, and I answered. Typically, fashion show etiquette declares that one must wear the fashion house’s clothes to represent the label. I was more than ready with my Zimmermann look, but due to a wardrobe malfunction, I had to lean on my backup outfit for the show. Although my original intention was to wear Zimmermann pieces, my look ended up reflecting the this season’s collection more than I could’ve anticipated. Flowing pleated skirt, mixing fabrics, cinched waist, and fine details (thanks to my pearled Nicholas Kirkwood boots). I stayed in a basic (but fierce) black colour scheme, but accented with pops of red (socks and Gucci belt bag). My fur coat kept me warm and also tied in the colours while adding another layer of texture. Once inside I walked around until the show started. I took to my seat only once the first row was completely full. I watched with eager glee as each look was more fantastic than the next. The Australian brand truly outdid themselves this season. Sisters Simone and Nicky Zimmermann are an inspiration, and for almost 30 years (launched originally in 1991 in the Paddington markets of Sydney), they’ve been etching their way into the fashion world with their unique voice and style. They’ve got some real momentum going, and this ready-to-wear is just one part of this year’s designs… have you seen their resort/swimwear collection yet!? The Zimmermann aesthetic is sophisticated, elegant, and feminine. When you see one of their pieces it’s easy to identify as Zimmermann, there’s always something about the detail or sewing technique that gives them away. They have a signature boho aesthetic, and that vision is always reflected in their designs. I loved this show and already have it on my list for next year!